My warmest congratulations to the Blue House Cluster project for receiving the Award of Excellence in the 2017 UNESCO Asia-Pacific Awards for Cultural Heritage Conservation. This award marks a proud milestone in Hong Kong's journey in heritage conservation and revitalisation, and I am honoured to join you all this afternoon in celebrating this significant achievement. We are thrilled as this is the first time a built heritage conservation project in Hong Kong has received the top honour, the Award of Excellence, since the inception of the UNESCO Asia-Pacific Heritage Awards in the year 2000. The Blue House Cluster project was chosen through a rigorous process from 43 entries all over Asia-Pacific. This top international honour recognises the inclusive and participatory approach in conserving these tenement buildings, which were constructed from the 1920s to the 1950s. The project not only preserves the unique architecture characterised by the easily distinguishable colour of its external walls, its classic timber floor stabs, staircases, doors and window frames and floor tiles, etc, but also immortalises the values of neighbourhood, self-help and mutual support that had built post-war Hong Kong. The close ties grown in years within the neighbourhood bred a bottom-up approach during the revitalisation of the Blue House Cluster that leads to the first trial of "Retain House and Tenant" concept, 留屋又留人, in our heritage conservation work. I was involved in this project from the very beginning in my capacity as the then Secretary for Development. I still vividly recall that Sunday morning when I met with the residents to listen to their views and expectations on the revitalisation of their homes. Since then, I have returned to this place time and again for numerous official occasions, including its Ground Breaking Ceremony in 2013 as well as its Official Opening in 2017, and also for publicity during my Chief Executive election campaign. I am gratified to be able to facilitate and witness this project from its inception to fruition under the persistent efforts and participation of residents, project champions as well as various stakeholders. Your hard work, as well as my unconventional or what David described as bold approach, if I may say so, have finally paid off in a big way. Like many other heritage conservation projects that have been commended by the UNESCO awards, I suppose the jury must be impressed by the diversity and depth of the community involvement delivered by this project. The Hong Kong House of Stories has been set up to record, research and exhibit stories about the local culture, providing a wide range of cultural tours, art and cultural promotion programmes to inspire a rethink of our society's development agenda, our way of life and our notion of quality living. The Good Neighbour Scheme has been put in place to attract and select new tenants who will be committed to actively participating in the preservation, management and programmes of the Viva Blue House. In a highly urbanised Wan Chai district, the public open area within the cluster has become a vibrant social space to foster greater interaction among the residents and the local community. Viva Blue House has not only conserved a cluster of historic buildings, but rekindles a strong spirit of care and share in the community. The project's success is attributed to the joint efforts of all partners, including St James' Settlement, Heritage Hong Kong Foundation, Community Cultural Concern and Blue House Residence's Right Group, as well as my colleagues from the Development Bureau. Their wholehearted involvement and steadfast support have given this project vitality and a defining character that can stand the test of time. The Hong Kong Special Administrative Region Government is committed to the cause of sustainable development and conserving our built heritage. We have adopted a multi-pronged approach in preserving our built heritage assets, with due regard given to development needs in the public interest, respect for private property rights, budgetary considerations, cross-sector collaboration, as well as active engagement of stakeholders and the general public. I am delighted that our efforts have been well-received. 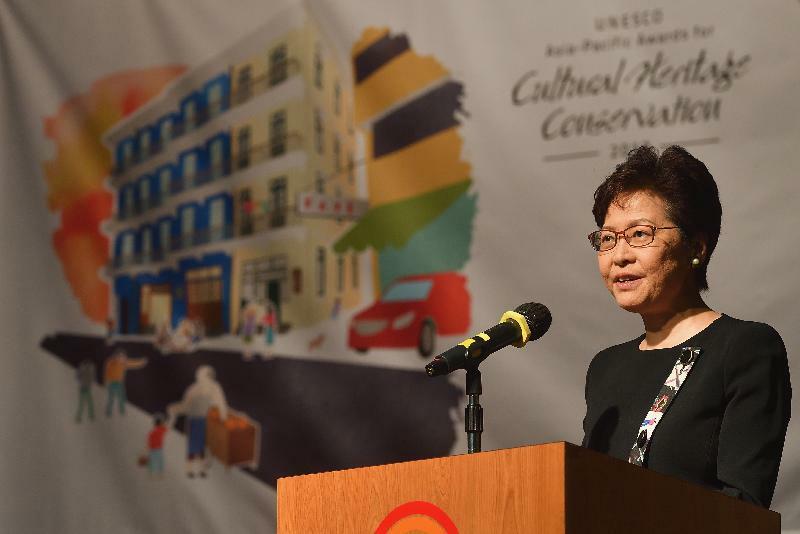 So far, 18 Hong Kong conservation projects have won UNESCO Heritage Awards. Of these, five projects are from our Revitalising Historic Buildings Through Partnership Scheme first launched in 2008. These projects are the Savannah College of Art and Design (Hong Kong), Tai O Heritage Hotel, YHA Mei Ho House Youth Hostel, Green Hub and this year, the Viva Blue House. It is indeed a great encouragement to Hong Kong and those who have worked tirelessly to make the best adaptive re-use of our historical assets by instilling creativity and innovation into the heritage conservation scene. This year marks the 10th anniversary of our Revitalising Historic Buildings Through Partnership Scheme. To date, the Government has launched five batches comprising 19 projects, of which nine already are in operation. Three more projects, including the Haw Par Mansion, Bridges Street Market and Former Fanling Magistracy, will come on stream in the second half of this year. Another major endeavour, thanks to the Hong Kong Jockey Club, the Central Police Station Compound, coined Tai Kwun, will be officially opened soon. Through adaptive and creative re-use, we inject life into these historic buildings and enable them to continue to support Hong Kong's economic and social development in the days to come. 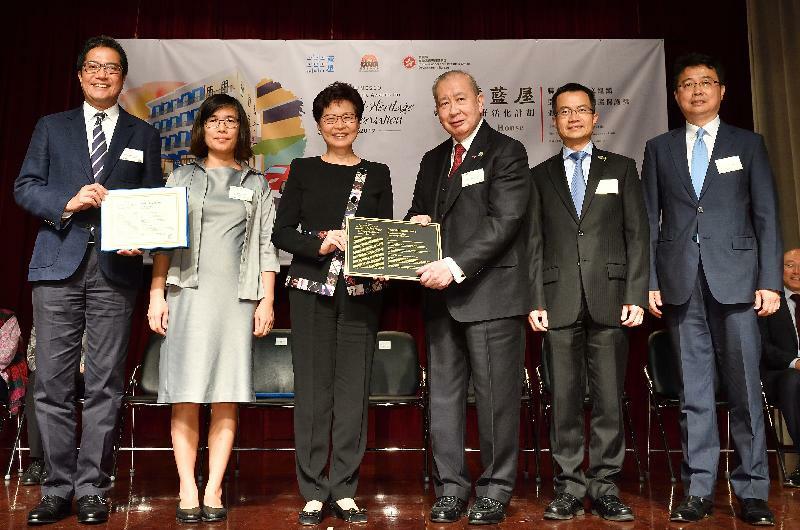 So once again, congratulations to St James' Settlement for its excellent work on this challenging revitalisation project and the great honour it has brought to Hong Kong. Thank you very much.